You know, breaking into Hollywood isn’t as easy as it looks. I had a great idea for a movie, the sci-fi family epic Hamsterus! Well that didn’t get me a deal with Spielberg. I have no idea why. What’s wrong with a touching film about the love between a young boy and his giant radioactive hamster? I don’t get it. So I set my sights a little lower and came up with the TV pitch President Hobo. Wouldn’t a show about a homeless President be a great fit with Scandal or Criminal Minds? For some reason no one else thought so. I even shopped around Murderchimp. I still don’t know what exactly I had planned for it, or even what a Murderchimp is, but even before I could set up a meeting my agent dumped me. But I went back to the drawing board. I don’t give up that easy, no matter how many people throw me out of their office. I had another brilliant idea! Since movies and TV weren’t for me, I was going to single-handedly revive the art of Old Time Radio drama! Yes! I was going to bring about a new Golden Age of a medium that no one cares about anymore. I had it all planned out and I was going to start with a revival of The Shadow, my favorite show. In a nutshell, The Shadow is a bored rich guy who uses hypnosis to convince everyone he’s invisible. Perfect for radio- everyone’s invisible! Problem is, those bastards at Conde Nast who own the rights served me with a cease and desist order. And after I had already written 275 scripts! Well, I’m nothing if not creative, so with a little smart editing I got rid of The Shadow and wrote in my totally new and completely unique character, El Kabong. I’m shopping it around now, but just to get some buzz going, here’s a sample. EL KABONG: Heheheheheheheh! Give it up, Phantom Gangsters! You have heard my mysterious laugh! I have you surrounded. PHANTOM GANGSTER 1: Surrounded? You’re only one guy, how can you have us surrounded? PHANTOM GANGSTER 2: Yeah, and we can’t even see you. What are you, chicken? Too afraid to come out and face us man to man? PHANTOM GANGSTER 1: That’s right, man to man to man! There’s two of us you know! EL KABONG: I am not hiding. I am El Kabong! PHANTOM GANGSTER 2: El Kabong! PHANTOM GANGSTER 1: Hey, I heard of this guy, he’s invisible or something. EL KABONG: I may be invisible but I assure you my guitar is solid as a rock! PHANTOM GANGSTER 1: OW! HEY! Where’d that guitar come from? PHANTOM GANGSTER 2: UGH! That hurt! PHANTOM GANGSTER 1: How many guitars do you have, anyway? 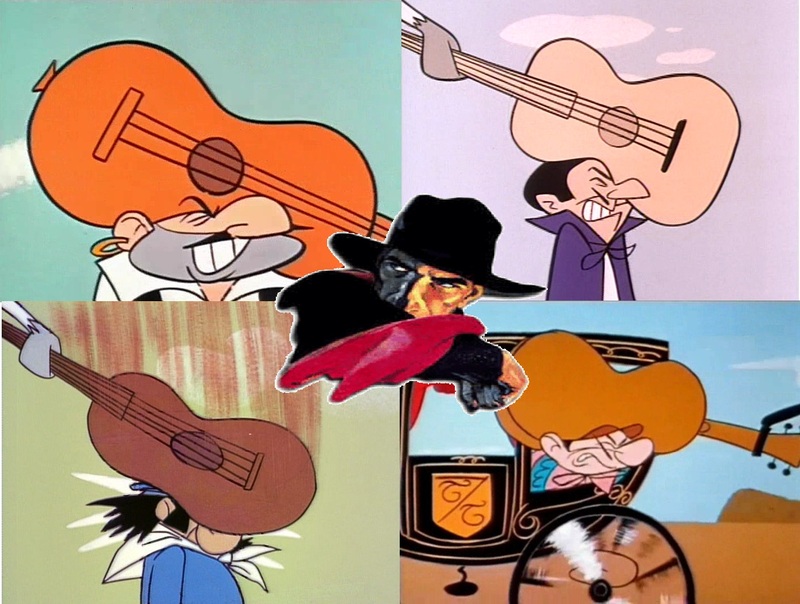 EL KABONG: El Kabong has many guitars. The guitars of justice! PHANTOM GANGSTERS 1 and 2: We give up! We give up! EL KABONG: Margie, call commissioner Walcott. Tell him he can collect the Phantom Gangsters, courtesy of El Kabong. Heheheheheheheh! PHANTOM GANGSTER 1: Jeez, always with the laughing. What’s wrong with this guy? PHANTOM GANGSTER 1: OK! OK! You don’t have to be so touchy! There you go! Spread the word! I’ll get The Shadow El Kabong on the radio any day now, I can feel it!